Here you are – my first free knitting pattern! This hat involves a technique called double-knitting – basically knitting two layers at the same time. You end up with a double-thickness hat, so one that will be lovely and warm and toasty. The hat is also reversible. If you’ve never tried double knitting before, give it a go – this pattern starts off gently with some easy non-patterned rounds to get you started before moving into the rectangular patterns. There are lots of descriptions/instructions and a photo-tutorial to help you with decreasing for the crown. 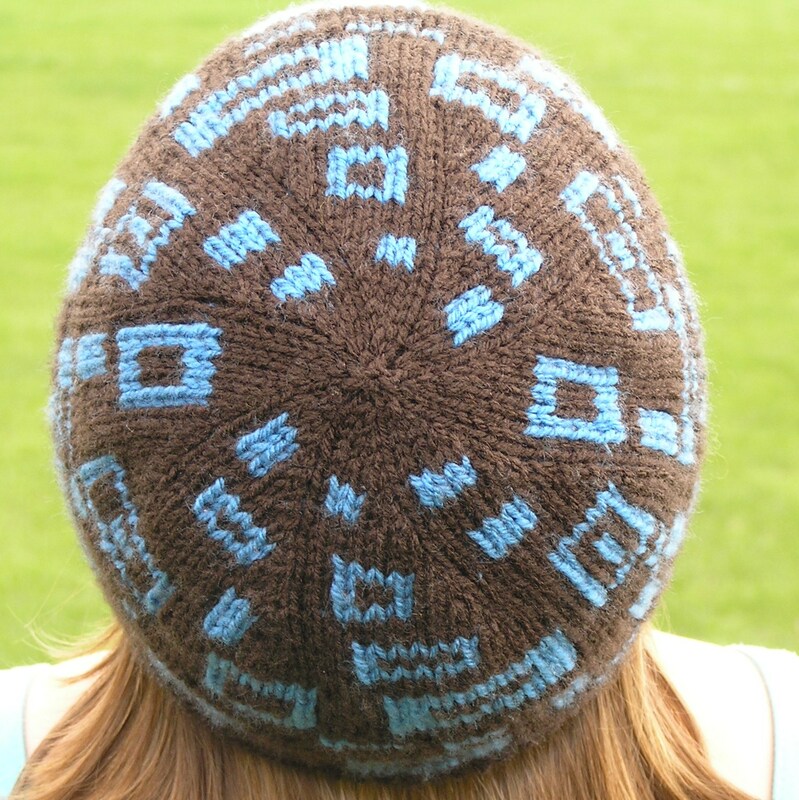 10 August 2011 – Here’s a link to a tutorial about double knitting from the Happy Seamstress – I thought it explained the technique clearly and the fact that it used the same colours as my rectangly hat was just a bonus! A big thank you to Kat, who you can find on her blog: http://creativepopoffs.blogspot.com/ – if she hadn’t encouraged me to write up the pattern and been a superbly helpful test knitter I would never have got round to doing it! I’m going to try it in a worsted weight, as I don’t have any DK currently. My daughter would love the colours that you chose for your hat, so I’ll have to let her have a go at the pattern as well. Thanks Margo – my test knitter used Patons Angora Bamboo which is labelled up as a worsted weight yarn and she got the same gauge/size as I did. Let me know how you get on and I’d love to see a photo when it’s done! I love this hat! I’ve never tried double knitting so I’m really excited to try. Thank you for the pattern, I think I’ll give it a go this weekend. I was looking for some really good warm patterns for charity knitting and I think this might be the winner. Let me know how you get on – leave me a comment if you get any problems! YAY!!! I just made a blog post about you posting the pattern. I see it has already been queued 30 times! Thanks again for a wonderful pattern! Just wanted to Thank You for sharing your skills and tell you I finished my Rectangly for my son and had a blast knitting it! This hat seems huge at the bottom. Should I keep going or start over with 20sts off? Tough decision! Are you thinking of taking the 20 sts off the 88 you cast on or the 176 you have on your needles after the first round? The pattern repeats every 22 stitches (based on 176 stitches) so if you think it needs reducing by that much I would remove a whole pattern repeat to make life easier, then you’d be repeating the pattern 7 times a round rather than 8? That would mean casting on 77 sts and increasing to 164 sts when you knit row 2. The only other option is to go down to a smaller size of needle – but if you need it to get dramatically smaller I don’t think that will work! How big does the knitting you’ve done so far measure compared with the size of the head you want it to fit? How many rows have you completed so far?